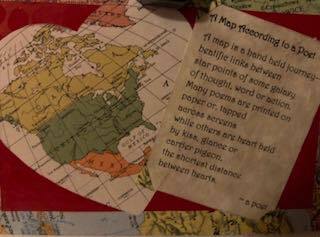 I am having a hodgepodge post with post cards and celebration of poetry. Link here today to share your blog post: This month has brought a bouquet of postcards, and I've sent some out myself. Mine were sent recently so if you know you are missing one, mine will be straggling in! I have been concentrating this week on a poem a day, and finishing my manuscript. So this post is going to be a bit spare on MY words, and concentrate on these! If you sent me a postcard and don't see yours here and think it should be here, let me know. I'll ask my husband. Sometimes he forgets that I want to see the mail, too! It could be in the car! Sure, now that I have things arranged I am changing the timing on the Linky if I can get back to it! Super cute post with the cards! There we go. Got it updated! I was all set to come back at 10 - thanks for hosting! Yeah, this is just the small exposed side my fridge...I have lots of older cards and poems stuck to the other surfaces. I bought special small, strong magnets for all my treasures. I will head on over there soon! Donna! Thank you for hosting and g'luck finishing your manuscript & writing a poem a day. February 1st was #WorldReadAloudDay and we TeachingAuthors are celebrating all week long! May 2018 be a year of victories for you—both personally and politically, and may a wave of kindness sweep across the globe. I am revising a bit and editing my manuscript now - and I have a "fairly impartial" family with three children ages 5 - 13 reading it and giving me feedback. Looking forward to reading your post. Maybe I'll join you - stay in my flannel nightgown, get a cup of coffee and read posts in the morning! 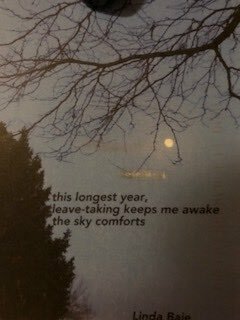 Thanks for hosting this week and for including my haiga postcard in your post! I'll be writing ekphrastic poetry alongside you this month--it should be fun! It's been a lot of fun so far! Challenging, but I'm trying to just let them spill out without much edit/revision. Love all the postcards Donna! Good luck with your book, and thanks for hosting! Thanks for hosting, Donna. I'm smiling because we could have collaborated on our posts today. I'm sharing those wonderful postcards, too! Happy Groundhog Day! Sounds good! Glad you posted. Thank you for hosting Donna. I am enjoying the postcard poems. Words and images in synchronicity. The postcard poem project is fun. It's nice to get some "real" mail - and poems! Oh, glad to see it you are back to you to dittying! I'll try to get there. I may have to make my self a "bullet journal" as Keri has, and keep myself on track for getting the important things seen to! 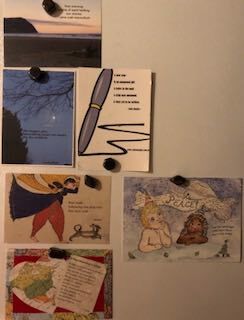 The postcards add a touch of joy to the refrigerator - with morning coffee and writing! Yay you for a poem a day and working on your manuscript - and hosting Poetry Friday. (Thank-you!) Sounds like a busy start to a productive month! Must...keep...focused! I wonder who will do the laundry?? Thank you for kicking off our February round-up, Donna! Thank you for sharing your postcard collection, and happy writing on your manuscript! Hey Donna! Thanks for hosting. Looks like you got a great batch of postcards! Hope you're staying warm. Yeah, about that "warm"... I'm up for spring any day now! Ha! When I first read this I saw "happy treasures" instead of "paper". They ARE happy, paper treasures, for sure! 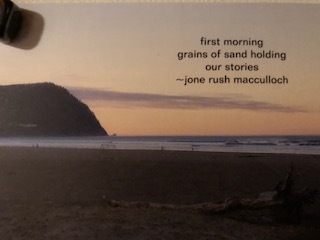 Happy writing, Donna, and thanks for hosting and sharing these marvelous postcards! Your refrigerator must be gorgeous! My refrigerator is a very busy place! And not just for food busy! Thanks for hosting, Donna! Those postcards are lovely. Hasn't it been great to receive them? I think I missed this last year, or one summer and I really felt like I missed out on something special. 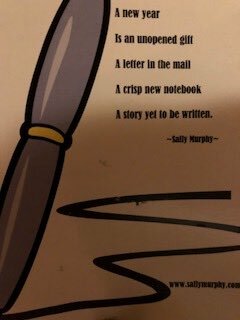 A poem a day AND a manuscript to finish---wishing you courage and peace to do both! And thank you for hosting and sharing your wealth of postcards---I might paper my walls with those. So lovely. Papering walls with my postcards! Oooh, I wonder...Maybe in our little bathroom downstairs? Wouldn't that be wonderful? Maybe I should just take pictures of them, print and paste - make collage of all the postcards past and present. Thanks for hosting, Donna - and what nice little vignettes of beauty to start our day! They are, Matt! I can see them as I write and grab coffee! Hello Donna! You are the Everywhere With Care person, having hosted Spiritual Thursday in such a light-filled way yesterday & now here you are back collecting us for Poetry Friday. And writing poems. And finishing your manuscript! Wow. I love seeing all these stunning creations from across the nation. (And from Sally M. in Australia...) Brava for the poetry postcard swap, which is great to track, even though I didn't participate this year. Best weekend to you with more thanks. As I sat in Starbucks on Wednesday for a bit I asked myself "What were you thinking?" LOL! But it worked out! I later thought, why didn't I try to combine the two? That may have made sense...with a Padlet for Thursday's group and a Linky for Poetry Friday. Loved your "Search" by Hester Knibbe. Thanks for this lovely collection of postcards Donna. I left a response yesterday, but perhaps it was eaten by an internet creature; so now there may be two. Good luck with your book and see you around the February Poem a-day prompts. Thanks for hosting the roundup. Oh, it is going to be a delightfully busy month!! And since it was snowing for Phil, I guess we will have more winter. So I'll just hunker down and get busy writing! Glad you were able to escape the Internet creature this time! Hah - your mail situation sounds like the one at my house...! What beautiful cards. 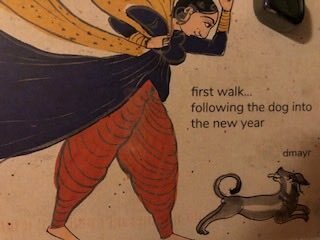 That's a great New Year idea for next time. Sometimes he actually gets in the house, but piles it on top of old and I don't notice it. There's so much junk mail and I forget to tell him I'm expecting "real mail"! It was fun! A nice way to break up the winter a bit, too! Mine should get to you shortly. Donna, thanks for hosting! The postcards look beautiful. Happy to see you! I love the postcard exchange. Have you done it before? Life should be busy! I can't say I'm getting done the things like laundry, vacuuming, etc. that I thought would be so much easier after the kids were out and I was retired, though! Oh, well! I'm having fun! Donna -- thanks for hosting today, and these postcards inspire me! I love having postcards come in and postcards go out. Mine are in the mail but you might have received it, Donna. Thanks for hosting. My PF post will be coming in later. I had implant surgery today and am rather exhausted. Hope you recuperate quickly and comfortably! Thank you for hosting, Donna, and sharing all those lovely postcards. It's such fun to get "real" mail, isn't it? Good luck finishing your manuscript! It brings me back to my "penpal" days when I got postcards and letters from Japan, Germany and Australia. Wish I'd kept up those correspondences! It would be nice to see a resurgence in people sending postcards to one another. Over the years I've saved all the postcards I've received, but it hasn't been all that many taken into consideration how many years this includes. Everyone sent postcards when they went anywhere. There are a few postcard exchanges organized on blogs and I usually participate. It is really fun and a blast from the past! I'm not blogging this week, Donna. Just stopping by to say hello and enjoy that wonderful gallery of postcards. Thanks for sharing them! I’m not surprised that you aren’t blogging this week. It’s a busy month for you! I love that you are organizing the Ekphrastic poetry challenge and so glad to be a part this year. It is an amazing inspirational nudge! Ah, post cards - that's a lovely and almost lost tradition these days. You've got a beautiful collection of poems, Donna. Thanks for hosting this week. 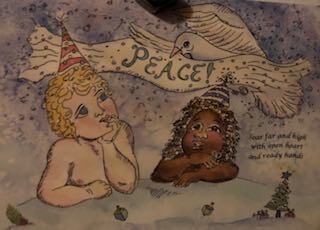 Thanks for sharing your splendid postcards, Donna, and thanks for hosting.